HONG KONG, CHINA—Shure Incorporated has struck two further blows in the company’s fight against counterfeiting as a result of close cooperation with Chinese authorities. An investigation initiated by Shure in Futian District, Shenzhen, in Mainland China led to a raid by the Shenzhen Administration for Industry and Commerce (AIC) on a wholesale shop, Sanze Electronics, and another at an associated warehouse. 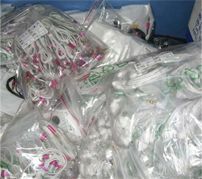 8,500 pairs of counterfeit earphones bearing the Shure name were confiscated. trademarks. Penalties imposed by the Shenzhen AIC against the wholesale outlet include the confiscation of all earphones, the requirement that the outlet cease its infringement activities immediately, and the imposition of a fine of 30,000 RMB. Penalties against the warehouse will be determined in the future.